Already a fun and social experience, watching live sports on TV is getting even more immersive with the addition of second screens. SportStream for iPad is a new app launching today which offers fans a social second-screen experience incorporating friends, followers, curated social media streams, real-time stats, and chat. SportStream was spun out of the real-time content discovery company Evri with $3.5 million in financing from Microsoft co-founder and Portland Trail Blazers and Seattle Seahawks owner Paul Allen’s Vulcan Capital. Talk about a value added investor, Allen is in a class with maybe himself and Mark Cuban alone who combine technology, sports, and billions of dollars the way they do. A well executed app like this becomes the perfect place to talk (trash) with friends anywhere in the world while being more informed about the game than ever possible before. It's a lot like watching the game at a bar with friends - if you had your laptop open to access stats and Twitter. As electric as the energy of being in the arena is, HD widescreen TVs showing 20 different camera angles with miked players and coaches, plus now internet connected second-screen experiences make home viewing in many ways a superior experience. The case for launching SportStream is rooted in existing user behavior. A recent Forrester report shows that 85 percent of tablet owners use their devices daily while watching TV, and 46 percent split their attention between TV and the tablet. This year’s Super Bowl, the most watched program in TV history, triggered more than 12,000 thousand game-related tweets per second, totaling nearly 14 million for across the five hour programming window. Unlike Twitter or Facebook, SportStream offers a social media stream featuring only relevant content to the game the user is watching. A semantic engine automatically identifies and tracks influential Twitter personalities, bloggers, sports journalists, teams, players, Facebook friends and fans. This filtering and curation is right on cue with what mobile users are pleading for amid information overload. Users can connect through Facebook to find the games their friends are watching and join them. The app also identifies the favorite teams and players users have ‘liked’ and automatically follows games they are likely to be interested in. Sportstream’s customizable chatrooms (both public and private) offer push notifications, including alerts about what friends are watching as well as the most talked about games. The subtle power in this was highlighted recently when MG Siegler sent a tweet about a no-hitter bid in progress by a NY Mets pitcher. The tweet alerted a father who was able to turn on the game and share the moment with his young son. The power of the internet and now mobile connectivity is to make life easier and more enjoyable. SportStream seems to have found a good balance of delivering relevant information while also creating a destination for interaction. The space is certainly rife with competition. The biggest challenger is likely to be ESPN. 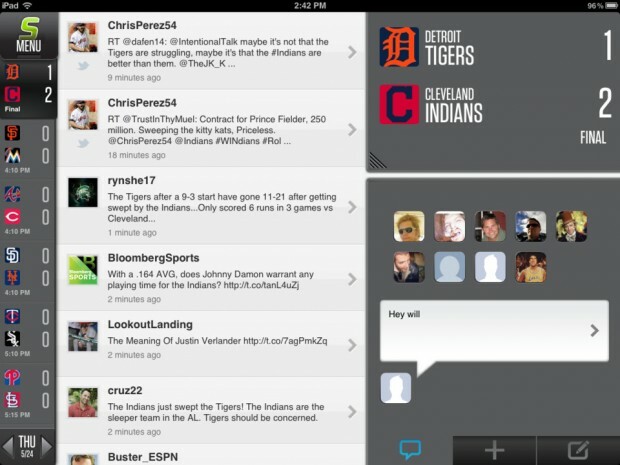 The all-sports-all-the-time network already has GameCast apps which deliver stats and curated social streams. Yahoo recently released IntoNow which automatically identifies what content viewers are watching on TV and delivers relevant second-screen experience based on that information. Comcast Sports Group rolled out its GameLive application to target the same audience. 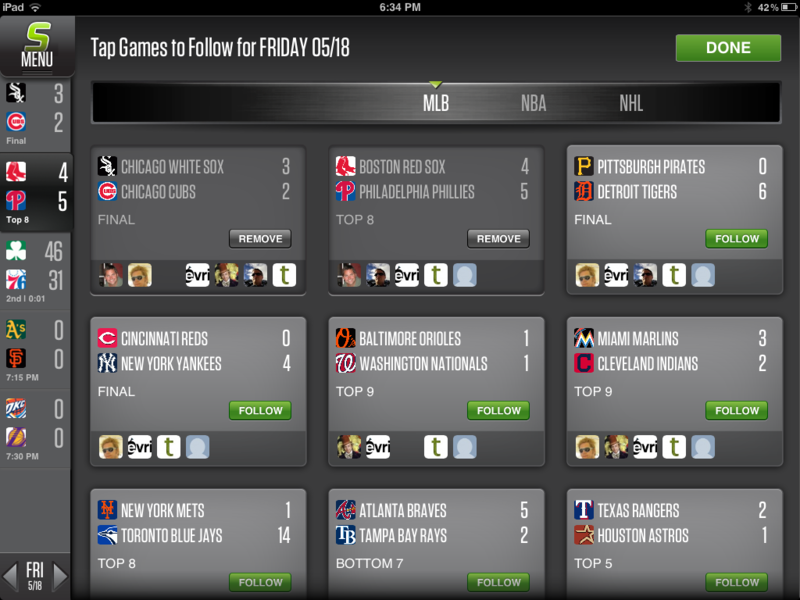 Third-party app Fanatix offers a similar social second-screen experience tailored to sports. SportStream has the right backers and a polished product for an initial launch. They were also smart to launch during the football offseason, allowing time to iron out any kinks and build awareness ahead of next season. Someone, or multiple someones, are going to win this space. Whether it can be a startup outsider remains to be seen.